Mary Parke Thompson, undated [ds4374]. Mary Parke Thompson and her husband David Thompson served as missionaries to Japan for over five decades. In the last installment of this continuing series, Mary recorded all of the pressures that had been building on their lives for months including disagreements among missionaries and an increase in government monitoring of Japanese Christians. In January 1875, David had begun his services as interpreter to the U.S. legation in Tokyo—a controversial appointment—and two people close to Mary had died. She did not record anything in her diary for over a month, then resumed on March 8, 1875. March 8, 1875: A period of interruption in noting the events of each day. A time of lying still and suffering and waiting and learning other lessons than those of books. I went up to school for the first time today….The work of building a native church goes on. Eight hundred dollars are already raised, the ground is rented—the open space north of this house—and the carpenter engaged—David has in some way gotten poisoned with lacquer again. [Sumac poisoning: the sap of the poison sumac is used in the making of lacquer.] His face is badly swollen today and very painful. March 12: David’s face much better today, but now his hands are very sore….We are thinking of putting up a little house to live in and save the money paid in rent for more needed purposes. March 13: David has gone to Yokohama this after-noon in order to preach there tomorrow. A strange gloom and loneliness seems to reign every where. I put my water-proof on and went out to take a walk because everything seemed to be in sympathy with me.—Our evening prayers as usual in Japanese conducted by Futagawa.—The doors are locked. I am alone with God with a burdened heart to lay before him. March 14: Dark and rainy, and I thought I would not go to church or Sabbath school this morning.—I feel so unhappy at the fading of some buds of promise that I thought about to open in my way. I do not wish to see any one. I have been crying a good deal and trying to pray and read my Bible a good deal. I thought, “I will stay home from Japanese service too. There would not be place for me in that small room.” After dinner while I was again on my knees praying for grace and strength and entire conformity of my will to God’s will, and for joy and delight in him, the thought came to me, You are acting very selfishly. Rise and do your duty to what you can and you will find a blessing in it. You should go and help to sing at the Japanese service when David is gone.—I rose at once, dressed and went. Through this little means, the gloom I have been nursing has taken its flight. God’s ways are always right. We are ever, I am ever weak and sinning.—I thought of meeting David tomorrow with dread. My face would be sad, my voice choked. He would be sure to ask why, and then I could not help from crying.—But now my heart is at peace and I can meet him brightly. When I can, too, I will tell him all. March 15: David came back this morning, and with his coming all the furniture of the house got life into it. I have studied my prescribed time with Futagawa. I have begun my Bible class in Acts in the school also. Futagawa and I will translate every day’s passage & David will correct it. A letter from Father today with a package containing a variety of flower seeds. March 19: I told my darling all last night. His dear true heart! God bless him a thousand fold. He at once receives joyfully and as the best thing what evidently comes from Heaven. To open all my heart to him, for the time, brought back something of the old heaviness and disappointment, but this morning it yields peaceable, even joyful fruit.—During this hour—from eight till nine o’c[lock]—every morning, while David is teaching his Bible Class, I have time for my own private devotions. I am reading the Psalms in course and studying a little into their rich meaning. This grows more and more a delight. March 21: I went to Mr. Carrothers’ preaching service today. I will go to the services of the different missionaries now while I have an opportunity, our place of service properly being too small to give me a seat to the exclusion of some Japanese. Mr. Carrothers baptized five persons. When I came home I was sorry that I had gone, for Prince Matsudaira’s wife and Takeyo’s wife were at church and afterward wished to see me.—Two Japanese members of the Greek church have been in to talk with David about Christian burial. David had to promise that I would go with him to Matsudaira’s the next day of preaching, the 24th. March 24: I taught this fore-noon in order to be able to go to the preaching this after-noon. The little lady received us warmly and treated us to chocolate and cakes. David preached about Christ, “the shadow of a great rock in a weary land.”—Lost our jinrikisha man on the way home, so we had a very long walk. But we took it leasurally [sic. ], looking into the shops.—A drunk soldier came up to David and began some foolish talk, evidently with the desire of getting into a fight. He placed his hand upon his sword in token of his intention. I was so frightened I could scarcely walk on. Once before, by just such a drunken fellow in Yokohama, David was hit with a stone and knocked down. Then the Japanese are such people, that, had we got into trouble today, though a crowd were round us and saw all, not one man would have lifted his hand to help. March 25: There was a congregational meeting of our native people today. They elected two deacons and one elder. March 28: One person, a doctor, was baptized today. Next Sab. [bath] is the regular Communion Sab., but this man has been ordered by the Government to Kiushu [now Kyushu] to remain there two years, and so, as he has been an applicant for baptism some time and under instruction he did not wish to go away unbaptized. March 31: We had an examination of our school today. Dr. Hepburn and Mr. Greene came up from Yokohama to attend. The scholars all did very well every one present thought, and of course we were proud of them. My classes in history, Gram. [mar], Geog. [raphy] & reading all pleased me well.—Dr. Hepburn examined them on their knowledge of the Bible. April 3: Today is a general holiday in all the public schools. The streets were crowded with drunken soldiers as we passed along, their swords dangling at their heels. I was really afraid, but our riding in a jinrikisha seemed a protection. April 4: Communion Sab. Six persons were baptized today. The rooms were so crowded I had to give my seat to a Japanese and withdraw. April 5: We came directly to the monthly missionary convention….It was decided, if possible, and as soon as possible, to have David’s translations of Genesis and Exodus printed. [Bible translation in Japan was done cooperatively by the Protestant denominations, hence matters of publication were handled not by the Presbyterian Mission, but by the more inclusive “missionary convention.”]—The frame of the native church erected today. April 6: Presbytery and mission meeting today. Mr. Miller offered his resignation and was accepted. They noted their disapproval of David’s accepting the interpretership, Dr. Hepburn and Mr. Carrothers only voting. Rev. 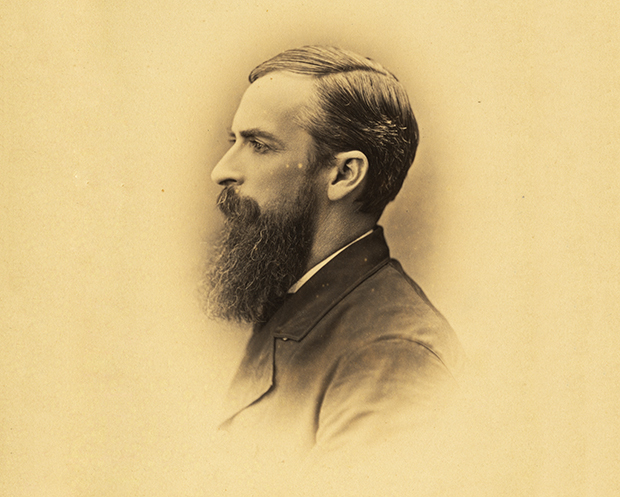 David Thompson, 1882 [ds4377]. Yesterday, [April] 11: An interesting day of work and worship. A woman who purposed [proposed?] selling her little daughter to a life of shame, brought to church by Ogawa [sic.]. [April] 12: The carpenters are putting the roof on the church today, and I never set my eyes on a building half so interesting as this. April 17: This is my first married birthday, and how tender and loving my darling is! Each little and great care and cross, and our faults—my faults in the end, always bring us closer together. In my lone life, I had not dreamed of such full tender love and joy, and I bless the Gracious Lord.—Much of the day busy with house-hold work, but about four o’clock we took a pleasant walk. David had in mind to get me a fine present, but I forbade it with our present slender purse.—Okuno and Futagawa for tea. That old man’s power of illustration and manner are very striking. O how I desire and pray that I may live a fully devoted life to the Lord from this day! How I long to be a true wife, gentler and more patient than I have been! How I long to make our home bright and happy always for my pure and noble husband! April 18: Okuno was at Sabbbath-school this morning and I let my class remain to hear him speak. His power is wonderful. When he had finished, quite a number were weeping, and among those too who were not Christians. April 20: A most interesting time studying. I am to begin Japanese history also learn of the poetry of this country, and of the Bhuddist [sic.] religion; of these both latter Futagawa can tell me so well. He made a great many poems while he was in prison that were given to the officers of the Government. April 25: The women of the church begin to think of me as specially theirs. They all make it a point to come and speak to me after the service. April 27: It is two years today since I reached the shores of Japan. I am sorry that I have done so little, that I speak the language so poorly, but outside of myself and my failures how much of blessing has come to me! And so we have quietly rejoiced together. April 28: Sold to Miss Youngman the large screen. I will use the money for surprising David on our wedding anniversary. May 1: Our house, the building of it, seems to be about determined. This after-noon while David was gone collecting for the church I secured my purchases for him against our wedding day-Anniversary. The Asakusa man who rented the ground and who with others is responsible for the church building is summoned to appear before the Custom House officers tomorrow. But God is our refuge and strength and we need not fear the face of them. We pray that it may be granted unto them that with all boldness they may speak the truth. May 2: Tsudzuki [sic.] and the others are required to hand in a written statement with regard to the church, its purposes, etc., to the Custom house officers. May 7: My mind was so full of thoughts I could not sleep last night. A year ago today, before God and many friends, we were married, and my heart is full of unutterable thanks for the rare noble gift I received that day. This morning while David was down hearing his class, I brought out and placed before his desk his new study chair, placed before it his new slippers, and on it the various other little gifts….Then O Ai came from Miss Youngman’s with a pretty wreath of white flowers which I placed on the top of the chair. All ready I went off to put on my prescious [sic.] old yellow linen dress. How I enjoyed his surprise! and when he is most pleased he says least. Next in order came Miss Youngman and O Chika with such loads of flowers I have not yet found places for all. The whole school intended to come bringing them, with their pretty dresses on, but the rain prevented, much to their disappointment. So Miss Youngman had to hire a jinrikisha and have them brought….We took a quiet ride out to beautiful Oji through the rain. When we came back David’s head ached, and the storm was so violent we thought we could not go to Miss Youngman’s for tea as was planned. The poor children have waited for us all day, and doubtless their disappointment is not slight. About six o’clock a package of twenty-seven letters came from them some written in English and some in Japanese to tell of their disappointment and to express their congratulations. And all in all the celebration has done us much good. Many resolutions are in my heart, for with the deep and full joy of today comes the remembrance of many failures. In the year has been bodily pain and disappointment, and we two stand alone as at this time last year, but how much we have grown to each other my heart finds no words to tell. Presbyterian missionary Rev. Christopher Carrothers, who opposed the Thompsons’ Union church. Presbyterian missionary Dr. James C. Hepburn and American Board of Commissioners for Foreign Missions (ABCFM) missionary Daniel Crosby Greene.